As part of our efforts to continuously improve our security infrastructure, eTribez is pleased to announce that we are now ISO 27001 certified! 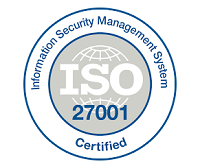 ISO 27001 is a specification for an information security management system (ISMS). Organizations that meet the standard can be certified as compliant by an independent and accredited certification body on successful completion of a formal compliance audit. Security has always been a top priority for eTribez. We have always been keen on security-oriented operation and development practices, as well as overall employee training and awareness. Having been successfully audited by information security departments of several international corporations, we understand the importance of security practices and industry-standard compliance for our clients. With eTribez Audience Management, your production can enjoy a dynamic solution that provides greater efficiency, while saving valuable time and effort. With Audience Management, audience registration becomes a fully-configured, fully-automated process with features such as quotas ticketing, and a large database that can be used for additional shows and general promotions. Audience Management enables engaging and meaningful interaction with audiences. With this innovative solution, your production can see and manage the details of your audience; for example, inviting someone with a birthday to receive a prize. Registration can be easily implemented within mobile apps, in IFrames, and on independent websites – all tailored for the production’s needs and fully-managed by eTribez. For more on this unique solution, see our Audience Management page on our website. TV Globo Brasil, the largest commercial television network in Latin America, has recently launched an audience campaign called ‘Audiences’ (‘Plateias’). Plateias invites people to be part of the studio audience for one of four shows – ‘The Voice’ and three other variety shows. TV Globo has received 14 international Emmys, and their international operations include a production and distribution division that distributes Brazilian sports and entertainment content to more than 190 countries around the world. As part of the online casting process for Plateias, eTribez has introduced a new ‘Quota’ feature that allows TV Globo to set the maximum allowed attendance for each show date. Our platform keeps track of the number and enforces the desired quota…helping Globo determine capacity for the show. The show’s casting is ongoing. For a look at the eTribez-powered URL, see: http://gshow.globo.com/participe/plateia.html. From October 17-20, 2016, eTribez will be attending MIPCOM, in Cannes, France. MIPCOM is the world’s entertainment content market. Each year, the largest industry players come to Cannes to form important connections and groundbreaking partnerships. To schedule a private demo with eTribez at MIPCOM, contact us.